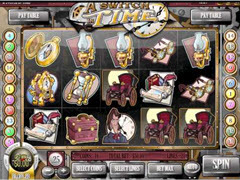 A Switch in Time is a time travel pokie that will see you taking a journey back to a time when life was simpler and the industrial age had just begun. What is neat about the way this game has been created image wise is the use of gears throughout the background and the way the logo of the game takes on a look of something you might see in a movie of a similar theme. This pokie comes with 20 pay lines and features these lines over 5 reels. There are many people who often wonder what it would be like to travel to the future or back to a different time in the world’s history. This is something that will always fill the imaginations of others as it is somewhat romantic and leaves people wondering how different their lives could be having the capability to be a time traveller. This is what dreams are made of and what drives some people to create new gadgets that become common day items years later. To ensure it gives an authentic feel, Rival has included many iconic inventions from our past such as the buggy driven coach, pen, sheets of parchment, oil burning lamps, ladies travelling case, alcohol canter, glasses, gold pocket time piece, spectacles, mantel clock and a professor type fellow. The special feature symbols will be the hourglass, the futuristic time machine and the lovely lady in green. The wild is the hourglass for this pokie game. It will double all wins it completes during normal play but will triple wins when playing the free spins. It also expands to cover off other positions on the reels. 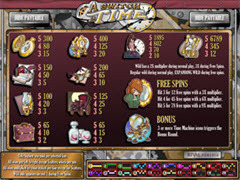 You can win free spins in A Switch in Time when the lady in green appears three times or more in any position. If three trigger the free spins then you win 12 free spins with wins being tripled. If you get four of the lady in green then you win 45 free spins with wins being multiplied by six but getting 5 lady in greens will see 78 free spins with a multiplier of 9! The free spins cannot be re-triggered in this game but the expanding wilds are in play and with the multipliers being what they are it can mean some serious winning! You will trigger the bonus feature game with the time travelling machine. This will see you off to various periods in time like the dinosaurs or off to the future. With each trigger of the bonus feature game you will experience a different point in the world’s history. This a nice production from Rival that will have you recalling images of days past, when stage coaches were considered the fastest mode of travel and when gentlemen were gentlemen and ladies were ladies.